FIQL is a nice niche social network focused on music playlists. Users upload, categorize and share their playlists with others. People who view the playlists can buy songs through links to iTunes and other music services. But for the most part they can’t simply listen to the songs online, other than through somewhat cumbersome links to Napster and Rhapsody, which allow people to listen to songs for free with certain restrictions. Since listening to music on playlists has so many restrictions, the service hasn’t grown much – it has just 15,000 playlists from 50,000 registered users since launching in 2005. But at 9 AM PST I have a feeling they will be getting a whole bunch of new users and a lot more playlists when they launch a new product called FIQL TV. That’s because they figured out a brilliant, if somewhat obvious, end-around to copyright laws that restrict them from playing music outright: music videos hosted on third party video sites like YouTube. It’s widely known that music videos are available on video sharing sites (some of them are even distributed legally). In fact, sites like Middio have sprung up that do nothing more than provide music video search for YouTube and other sites. There are a number of services that also allow people to download these videos to their hard drives (see our own YouTube download tool) – and converting them to iPod format is only a small additional step. Videos are regularly pulled down as copyright holders complain, but they are quickly re-added by other users. That means bookmarks of videos often go stale, but using a search engine will always help you find what you’re looking for in no time. So here’s what FIQL has done – users can create a playlist on FIQL, or import an existing one from iTunes or other services. 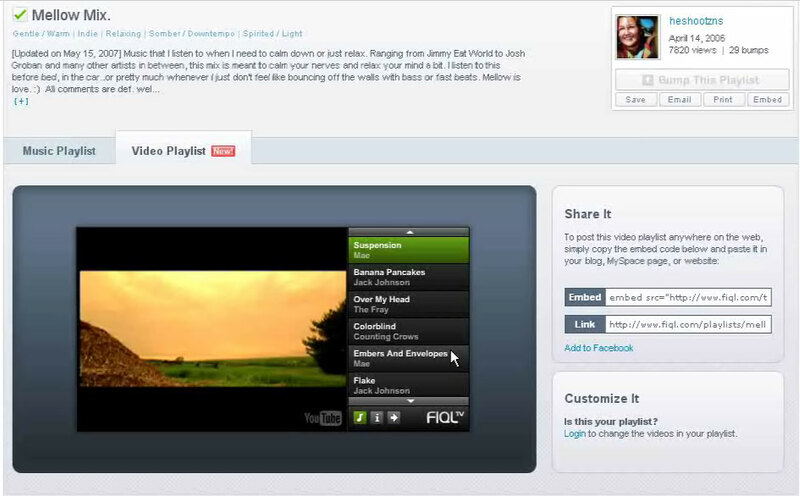 FIQL will then go out and grab music videos from the third party video sites and add them to the playlist. 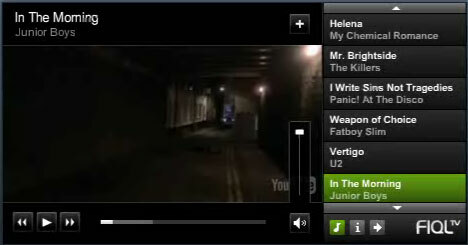 You and others who view the playlist can then play the videos. FIQL has also created an embeddable player for those videos that can be dropped in to MySpace and other social networks and websites, or add it to their Facebook application. So now, if you have a favorite playlist in iTunes, you can simply export it to FIQL and get an embeddable player back that plays the music videos of all your songs. An screencast overview of the new service is here. Or, mostly. Technically FIQL is still subject to copyright claims. But they’ve pulled themselves one step away from direct contact with the content owners, who are mainly focused on the sites that actually host the infringing content. Case law is still developing in this area, but they are under little real threat of litigation.